Castleton University is moving swiftly into the future. Having added several cutting-edge initiatives already this spring and summer, the university announced Thursday that it will be adding eSports to its growing list of club sports offerings. eSports is one of the fastest growing industries in the world and counts millions of gamers, fans, and some of the world’s largest investors among its supporters. 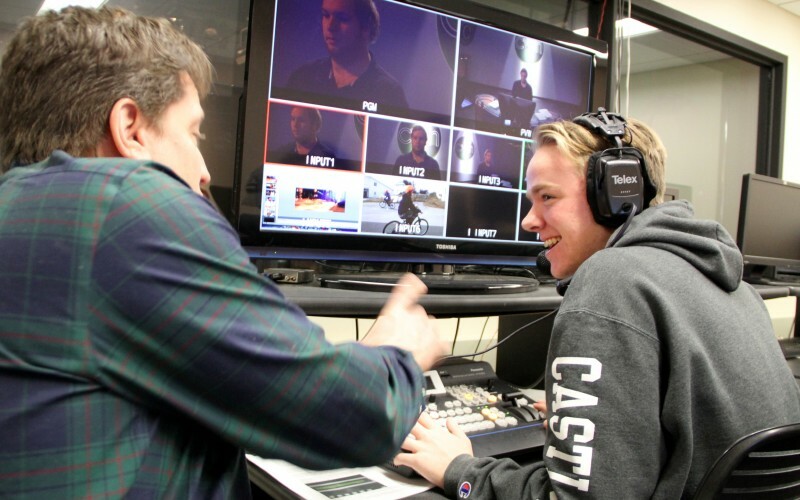 Chief Technology Officer Gayle Malinowski and Castleton sophomore Jac Culpo (pictured above editing video with Professor Andrew Wilson) will serve as the advisor and club president respectively and the duo has already taken the lead in recruiting team members. Varsity sports have been a strong presence at Castleton University dating back to the early 1960’s when teams competed in the NAIA. A transition to the NCAA Division III in 2001 signaled growth was on the horizon. Castleton students have recently added badminton, bowling, cycling, curling, and ultimate frisbee to the growing list of club sports. Badminton and cycling each boast rosters of more than two dozen students, while the bowling team had the fourth-ranked bowler in the country this past season. The success of these programs makes the prospects for eSports very enticing. While Castleton considered adding eSports as a varsity program initially, the decision to encourage its students to build the program before eventually elevating it to varsity status held vast appeal to all involved.